Morimoto demonstrates how to play the Koto. 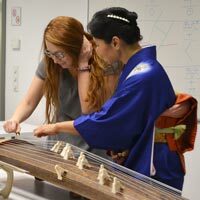 Famous Japanese Koto player Masami Morimoto visited Webster Vienna for the second year in a row as part of the Cultural Anthropology ANTH 2510/50: World Music course. Morimoto delivered a brief lecture on the history of Koto and then gave an introduction on how to play the instrument. Webster students and faculty also had the chance to try this fascinating string instrument. See photos from her visit with students in this Webster Vienna story or in this Facebook post. Learn more about Webster University Anthropology and Sociology programs here.